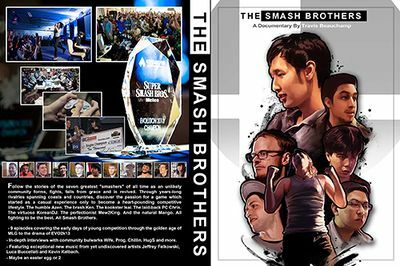 The Smash Brothers DVD cover. The Smash Brothers is a documentary series directed by Travis "Samox" Beauchamp, released in October 2013, shortly after the then-largest Melee tournament of all time, EVO 2013. It is primarily about the competitive scene of Super Smash Bros. Melee, with nine episodes that detail the competitive scene of the game and its developments since its debut; in addition, the series covers multiple retired and active professional Melee players, as well as their effects on the Melee metagame over the time-span of a decade. Since the documentary came out, competitive Melee has steadily increased in popularity. The seven "Smash Brothers", in order on the poster from left to right are: Azen, Isai, Ken, PC Chris, KoreanDJ, Mew2King, and Mango. The overall total budget series amounts to $12,000. Metagame is an up-an-coming series follow-up that covers the current "Gods of Melee" Mango, Armada, PPMD funded with a Kickstarter of $34,583. As of January 22nd, 2017, only 4 episodes have been completed being done with only half of the series. Amsa and Wes were mentioned as part of a promotion video as well. This page was last edited on February 8, 2019, at 16:51.